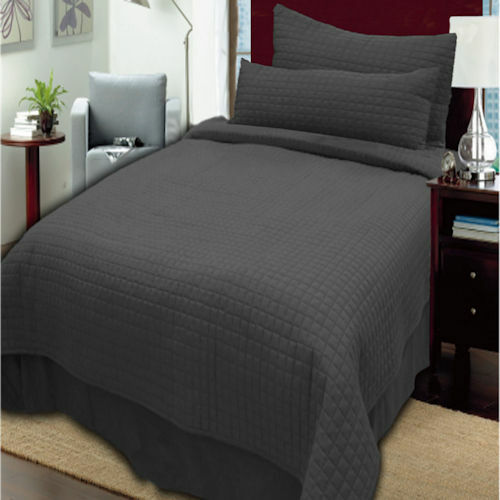 The Twin Box Quilted Coverlet Sets are an excellent option if you need affordable, easy-care bedding for hospitality and commercial use. The Palmetto Box Quilted Coverlet Sets are manufactured with a brushed microfiber outer fabric and plush down-alternative polyester inner fill. 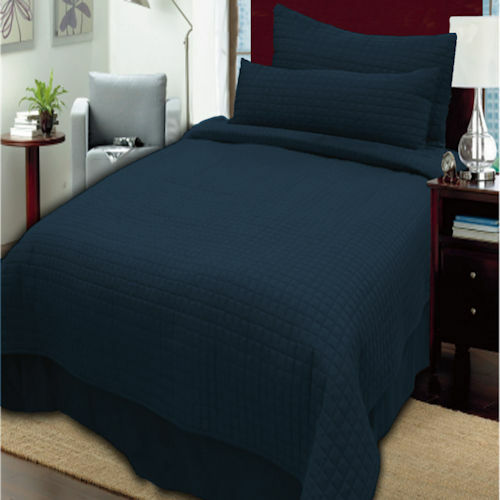 The result is a machine washable top of the bed quilt set that is soft, and durable for repeated commercial use. 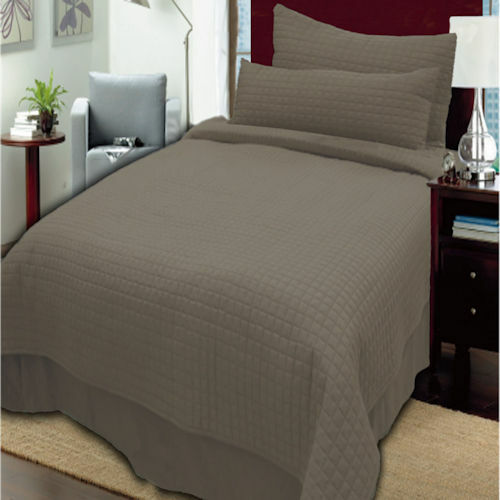 The Coverlets and Pillow Shams have a 1-inch box quilting pattern for a modern design. The matching microfiber bed skirts have a 15 smooth finish drop with corner and center pleats. The solid-colors are color-fast and bleach safe for easier laundering. In addition to the easy-care colorfastness, the box stitching also adds strength and secures the down-alternative fill to eliminate shifting and clumping when laundered. 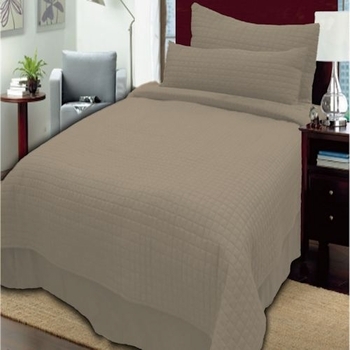 The Twin size Palmetto Hospitality Quilted Coverlet Sets are in stock in 10 color options. Purchase wholesale by the case of 3 complete sets with Free Shipping on every order, large or small! Easy-Care, Wrinkle-Free Bedding - Machine Wash and Dry. 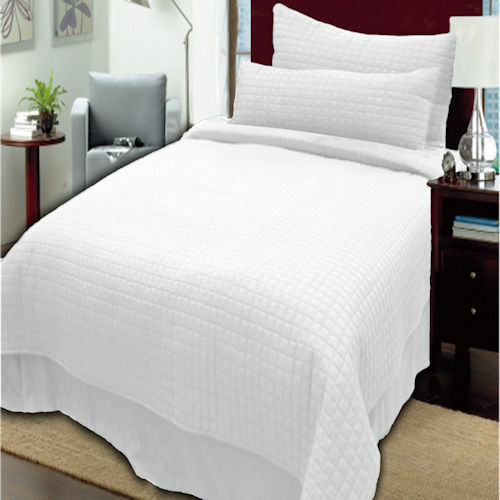 Durable Quilted Construction, Modern Micro-Box Design - Intersecting box-stitch pattern eliminates shifting and clumping. High-Quality, Double Brushed 120 GSM Microfiber Polyester Fabric - "Peach Skin" soft-to-the-touch, yet extremely durable fabric. Coverlets and Pillow Shams Filled with 150GSM Down Alternative Polyester - medium-weight warmth. Fast Drying - Microfiber dries approximately 30%-50% faster than cotton and cotton-blends. Zero Shrinkage - Microfiber doesn't shrink when laundered like cotton and cotton-blends. Stain-Resistant, Color-Fast solid colors are bleach-safe. Twin Coverlet Sets available wholesale by the case of 3 sets with Free Shipping on all orders!